Robust demand for luxury homes proves that Singapore remains a top investment destination among high net worth individuals. 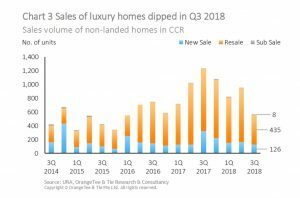 A new report from OrangeTee & Tie said interest for luxury homes remained firmed as the number of homes sold ≥ $3 million was higher than the four-year average. 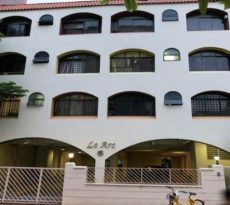 Six super luxury homes with price tags of ≥ S$10 million were transacted after the latest cooling measures. 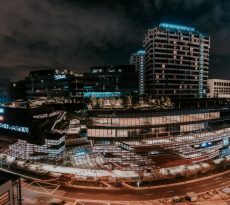 This suggests that there is robust demand for luxury homes and that some foreigners proceeding are with their purchases despite the heftier ABSD imposed on foreign purchases, said the report. The robust demand for luxury homes is also evident in the consideration by some that properties here are still cheaper than in countries like Hong Kong. “The steady demand for luxury demand homes above S$3 million suggests that Singapore remains a top investment destination among high net worth individuals and affluent foreigners,” said Christine Sun, Orange Tee’s Head of Research and Consultancy. 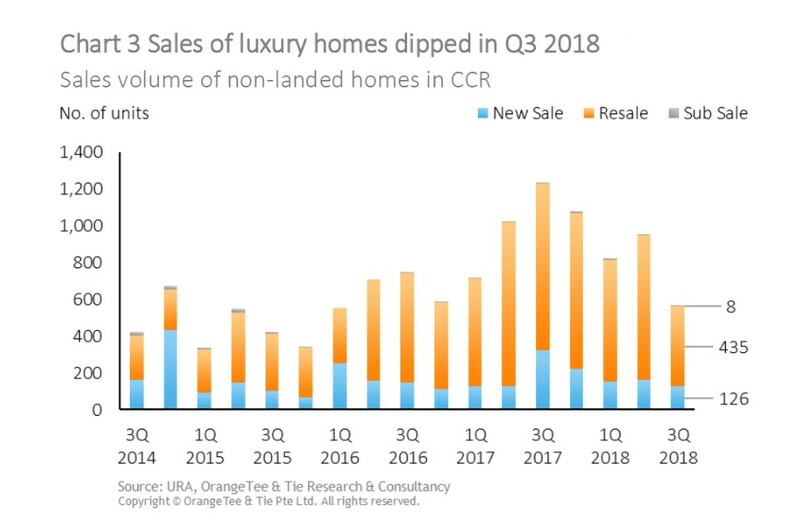 The Orange Tee report noted that the average price of new luxury non-landed homes reached a new high of S$2,819 psf in Q3 2018, while resales reached a new high of S$2,063 psf. 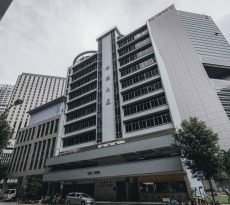 The data presented by the prominent real estate firm said the priciest luxury homes transacted was a 17th floor 438 sqm resale unit at the Urban Resort Condominium for S$13.9 million (S$2,948 psf). This is followed by a 273 sqm unit at Bishopsgate Residences for S$11.5 million (S$3,913 psf). A 16th floor 290 sqm unit at Twentyone Angullia Park (S$3,524 psf) and a 13th floor 285 sqm unit at 336 River Valley (S$3,586 psf) were sold at S$11 million each. It further noted that in the Q3 2018, 62 super luxury condominiums were sold at ≥ S$5 million, and that seven super luxury homes were sold at ≥ S$10 million, six of which were transacted after the latest cooling measures. For Q1-Q3 2018, 474 luxury non-landed homes were sold at S$3 million-<S$5 million and 296 units were sold for ≥ S$5 million – all pointing to the robust demand for luxury homes. The robust demand for luxury homes suggests that Singapore remains a top investment destination among high net worth individuals and affluent foreigners, said the report. Adding that the ongoing US-China trade war may have also spurred some Mainland Chinese to park their monies here to hedge against the devaluation of the Yuan driving up the robust demand for luxury homes. It suggested that Indonesians may have also transferred their funds to Singapore as a hedge against further depreciation of the rupiah. “The proportion of non-landed homes bought by Singaporeans rose from 75.4 per cent in Q3 2017 to 78.2 per cent in Q3 2018. Despite the hefty ABSD imposed on foreigners and PRs, foreigner purchases fell marginally by 0.5 percentage points q-o-q to 6.1 per cent in Q3 2018, and by 1.4 percentage points to 15.0 per cent for PRs over the same period. Mainland Chinese remained as the top foreign buyer in Q3 2018, followed by Malaysians and Indonesians. A majority of 82.4 per cent of Malaysians, 71.2 per cent of Indians and 63.1 per cent of Mainland Chinese buyers bought homes that cost below S$1.5 million. 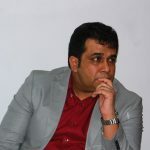 The report said that based on its projections, there could be about 17,000 to 19,000 new homes being launched next year. “The sales momentum for 2019 may remain at the current level or rise slightly when the effects of the cooling measures start to wear off. We estimate that between 10,000 and 12,000 new homes could be sold next year. This is slightly higher than the new sales volume for this year (estimated to be between 8,000 and 9,000 units) as there are more launches slated.